Project Delphi is Leonardo’s experimental hub that we are using to explore how to reimagine Leonardo for the next 50 years and beta test the future. It provides a space for international dialogue in the community before, during and after each of our global anniversary celebrations. Project Delphi collects and publishes ideas, concepts and the work of researchers, scholars, artists and innovators. We invite you to join the conversation today. During 2017–18, we will be collecting, curating and disseminating the results of these online and in-person collaborations. And at the end of 2018, this invaluable input from our community—from you—will help to inform how we redesign our programs and refocus our mission for the next 50 years. We are committed to a transparent design-thinking process with you at the center. To help us reimagine Leonardo's next 50 years, join us in Project Delphi where we will be gathering and sharing responses with the community. To start, we have three questions for you, beginning with the one below. In this moment right now, describe who you are. What are you exploring, creating or imagining? What’s the question we should be asking? Beginning in mid-2017, we invite you to share your ideas, experiments and history with Leonardo. Feel free to participate in the dialogue on http://leonardo.info/project-delphi. The Delphi method (/ˈdɛlfaɪ/ DEL-fy) is a structured communication technique originally developed as a systematic, interactive forecasting method that relies on a community of experts. The Rand Corporation developed the Delphi method in the 1950s to forecast the impact of technology on warfare. The Leonardo Project Delphi is designed to facilitate international dialogue in the Leonardo community. This page serves as Project Delphi's hub where we collect and publish the ideas, concepts and work of the researchers, scholars, artists and innovators. Join the conversation. 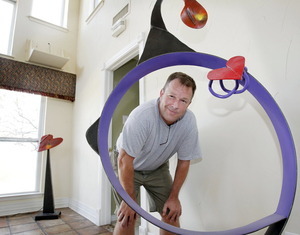 Scott Trent is a metal sculptor and the founder and event director for the Henderson Art Project, 2009–2011. He received his PhD from the University of Texas at Dallas in the school of Arts & Technology. His area of specialty is Design, utilizing digital media that facilitates collaboration. University courses taught by Scott include Digital Imaging, Information Design for New Media, Business and the Digital Arts, and Principles of Design. To find out more about Project Delphi, contact Scott at scott@inxlab.com. Would you like to facilitate Project Delphi in your community? We have printable materials for you to download. Questions? Contact Scott Trent at scott@inxlab.com.